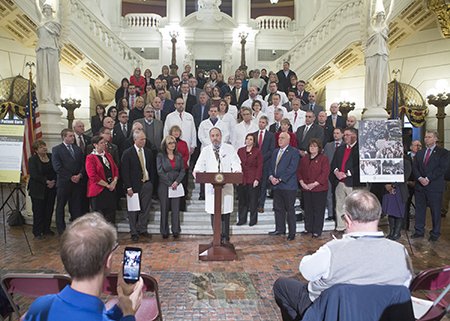 This week, I participated in a Capitol news conference to bring greater attention to an issue that could make it more difficult to attract doctors to Pennsylvania, especially in less urban areas like ours. Currently, medical malpractice cases must be brought in the county where the alleged malpractice occurred. If that rule is repealed by the court and lawyers are allowed to shop around for a more favorable court venue, doctors’ insurance premiums would skyrocket. Lawyers would bring cases, regardless of where the case arose, in plaintiff-friendly Philadelphia courts, where juries award huge damages. For example, our local doctors and hospitals practicing in Franklin County would be sued in Philadelphia. When this happened in the early 2000s, doctors closed their practices, moved to other states or retired early. You can watch the address on my website, RepSchemel.com, at 11:30 a.m. and keep your eyes on my social media for updates and reactions. The commission will send out surveys to lapsed hunters who haven’t bought a license in two years to gauge why they no longer hunt and what could bring them back into the woods – including moving opening day to Saturday and Sunday hunting. The ban on Sunday hunting would have to be lifted by the Legislature before the commission could address it. If you have any thoughts or comments on the proposed move, please let me know. Learn more here. Applicants should not pay a private entity for assistance in filing the forms. Remember, my office can provide that service at no cost. The deadline to apply is June 30. Learn more here.